Practice Review is a mandatory component of the Quality Assurance Program at the College of Medical Laboratory Technologists of Ontario (CMLTO). Its purpose is to provide an objective assessment of a member's professional practice. Randomly selected members must answer 25 questions, online, related to the CMLTO standards of practice and the application of professional knowledge, skill and judgment. Case scenarios address situations in which medical laboratory technologists (MLTs) may find themselves while practising in the profession. 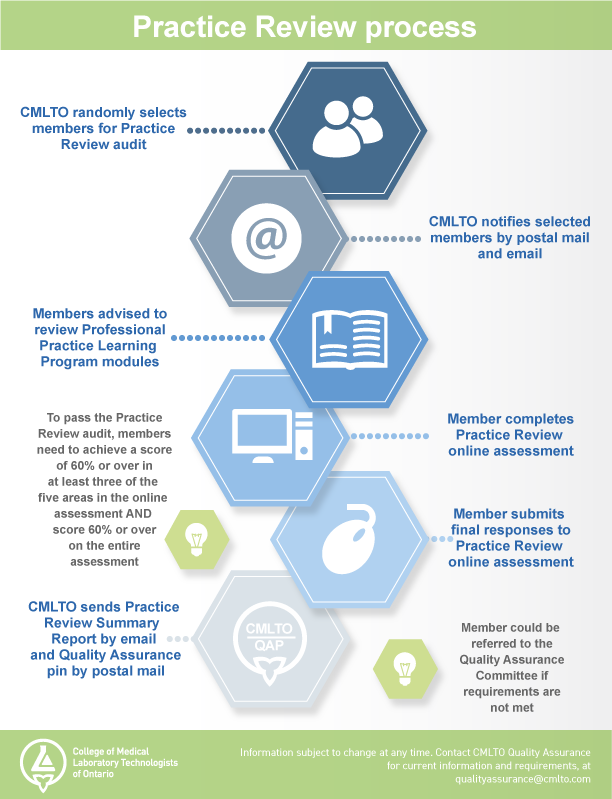 To prepare for Practice Review, members can use the Professional Practice Learning Modules available on the CMLTO website. Question: What happens if I get audited? Answer: The Practice Review audit process is described below. Members are randomly selected from the Practising member database for the Practice Review audit. Members are notified by mail and e-mail that they were randomly selected for the Practice Review audit. The notification includes detailed instructions to access and complete the audit. In preparation for the audit, members should review the Professional Practice Learning Modules. Using the instructions, members will complete and submit the Practice Review assessment. On average, members spend one hour reviewing the Professional Practice Learning Program modules, and one hour completing the Practice Review assessment. Members who have successfully met the audit criteria receive their Practice Review Summary Report and a Quality Assurance Program pin by mail. If a member does not complete the Practice review audit, they are unsuccessful in meeting the audit criteria, and/or they do not respond to communications from the CMLTO, their file is referred to the Quality Assurance Committee for review. Question: Is the Quality Assurance Program mandatory? Answer:The program is mandatory for all CMLTO Practising members, regardless of employment status. Question: How are members selected for audits? All members who hold a Practising certificate of registration are eligible for Practice Review. Members who have already been selected for Professional Portfolio audit in the same calendar year are excluded. Question: What is the difference between the Professional Portfolio and Practice Review audit? Answer: The Professional Portfolio audit directs members to submit their self-assessment, set goals, and complete and record a minimum of 30 hours of activity focussed on new learning. The Practice Review audit directs members to answer 25 case study questions focussed on the learning modules presented on the CMLTO website. Question: What happens if a member cannot meet the submission deadline? Answer: It is recognized that sometimes members’ personal or professional circumstances do not allow them to submit their audit information by the submission deadline. In extenuating circumstances, written (e-mail, fax or letter) requests to delay the date of submission will be considered in accordance with CMLTO policy. Question: Is the member’s employer notified when the member is being audited? Answer: Employers are not informed when a member is being audited. The legislation requires all information collected during an audit remain confidential. This information cannot be used for other purposes, even by other CMLTO Statutory Committees. Question: How are the submission deadlines decided? Answer: Deadlines for submitting audit information are based on the Medical Laboratory Technology Act, 1991 and internal CMLTO Quality Assurance Committee policies. Question: What is the pass criteria for the Practice Review, and what if I do not successfully meet the criteria? An overall score of 60% or more on the entire assessment. If the member does not successfully meet both of these criteria, their file is referred to the Quality Assurance Committee for review.